Atos has again been ranked as a leading provider of SAP HANA® services in Germany by technology and consulting firm Information Services Group (ISG). 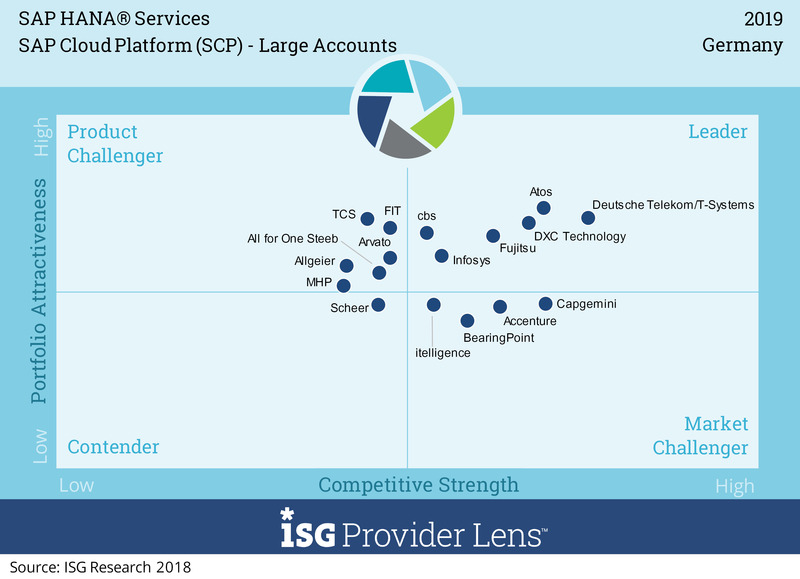 In the current ISG Provider Lens – SAP HANA Services Germany 2019 – Atos received the “Leader” badge in all categories and maintains one of the top positions. This is the fourth time in a row since 2016 that Atos has been recognized for its expertise in SAP HANA Services. In the current study, ISG analyzed 42 SAP HANA service providers in the German market and evaluated them in five areas, differentiating between midmarket and large accounts. The evaluation criteria in these areas were strategy &vision, innovation, brand awareness & presence in the market, sales &partner landscape, breadth & depth of portfolio of services offered as well as technology advancements. Learn more in the ISG Study – free download available! Atos is a powerful end-to-end provider in the SAP HANA market, offering a broad portfolio including proprietary procedure models, tools and best practices. Atos provides a comprehensive offering for designing, implementing and using BW on HANA & BW/4HANA and lean methods and procedures are available to specifically address midmarket requirements. Atos provides a portfolio of powerful solutions for all relevant aspects of the HANA technology as well as a high degree of flexibility, which also suits midmarket businesses. Based on their customers’ existing hardware, Atos offers a convincing solution for a HANA managed cloud and also provides a platform for the overall management of hybrid use cases, including third-party providers. Atos demonstrates the strategic relevance of SAP Cloud Platform within their portfolio and uses SCP for innovative topics. Download the ISG Provider Lens 2019 – SAP HANA Services & Solutions research study! The utilization of the SAP Cloud Platform (SCP) as SAP’s central integration platform has a high priority for us. We already have a number of successful SCP-based use cases and solution scenarios, e.g. in the context of Siemens MindSphere for integrating machine data into ERP systems or of machine learning with SAP Leonardo.